Many patients complain that their eyes are very dry. Others complain their eyes are very wet and tear all of the time. It can be confusing, but these two problems usually have a similar reason that causes these problems. The most common reason is that the eye does not have good quality lubrication. That makes the eyes feel sandy or gritty. Lubricating tears are different than crying tears. Another reason for dry eye and the wet eye is that the tears evaporate too quickly or that there are not enough lubricating tears. There are solutions. In our office, we take a ‘start-simple’ approach and increase as we need to. You can say we take a “tiered” approach. Most people begin with over-the-counter artificial tears and when that has not worked, they seek out help. Other solutions include prescription topical medication or oral medication. Nutritional supplements with Omega 3 fatty acids can make you more comfortable by helping your body create a better quality tear. Lid scrubs, punctual plugs, and/or amniotic membrane may be needed. Dry eye occurs frequently after menopause and there are different medications for men than there are for women. Inflammation can cause the eyes to be red or feel like they are burning. Prescribed medication such as Restasis or a short-term topical steroid eye medication may be needed. 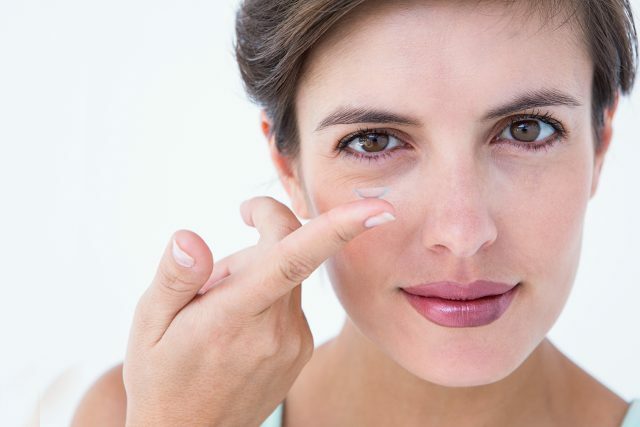 Lacrisert (Bausch + Lomb) is a slow-release lubricant placed in the sack between the lower eyelid. It slowly melts and produces a moisturizing effect that lasts all day. Scleral lenses can be used to protect the eye and give relief. If an eye is dry to begin with, then soft lenses can make that problem worse, particularly if you use computers or like to read a lot. The point here is that dry eye and the wet eye can be treated successfully when a logical systematic approach is used. The doctor and patient need to work together work as a team. We can make recommendations but you must do your part to help you solve your problem. There are many over-the-counter eye drops and that can be a source of confusion. Which should I take? People often try one and then different ones. A better approach to finding the cause of the problem works better than a ‘shot-gun approach’. Some products that are heavily advertised are usually used first. Thinner ones may only last a short while and thicker ones may make you blurry. People find they need to use this eye drops several times a day. Thicker drops may last longer but may make you blurry when driving or working on the computer. Thinner drops may only have a very short benefit. A hodgepodge approach usually leads to little relief and lots of frustration. Some people may need warm compress, nutritional supplements, or lid scrubs. At times prescription medication is needed to addresses the inflammation to help your body produce more natural tears to keep your eyes moist, comfortable and healthy. Dry eye syndrome (DES) and Ocular Surface Disease (OSD) is a range of conditions. They can make people miserable. Most cases of dry eyes can be improved significantly with the right treatment. Dry eye can also cause blurred vision and difficulty with night driving. A special Dry Eye Evaluation enables us to determine the cause and how severe the problem is. We treat the problem starting with the most simple approach and then progressing from there. There are some 10 different treatments that increase in complexity. You could say we take a tiered (pronounced ‘teared’) approach to dry eye. Sometimes we must combine various treatments. Click here to read more about Dry Eye and Wet Eye.